This time last year* I wrote a blog post about being a duck in the mist. I had spent 2017 paddling furiously under the water while looking serene and unruffled to onlookers. Lots of writing projects had been completed but not released. 2018 was going to be the year of getting those writing projects out in the world. And it was. In 2018 I stopped paddling, made it to dry land, and became the creator of multicoloured splats. I splatted in all sorts of directions and had loads of fun doing it. There were black horrific splats and green/purple swirly weird splats. There were novel, novella and short story length splats. It was messy. I really enjoyed it. 2018 saw the release of both The Beauty and The Arrival of Missives in the US/Canada. Titan Books came up with two stunning covers, and also asked me to write two new novelettes to accompany those publications so I wrote ‘Peace, Pipe’ and ‘The Last Voyage of the Smiling Henry’, both of which got stuck into genre concepts that I love – first contact with aliens, and getting shipwrecked on an island with terrifying creatures. 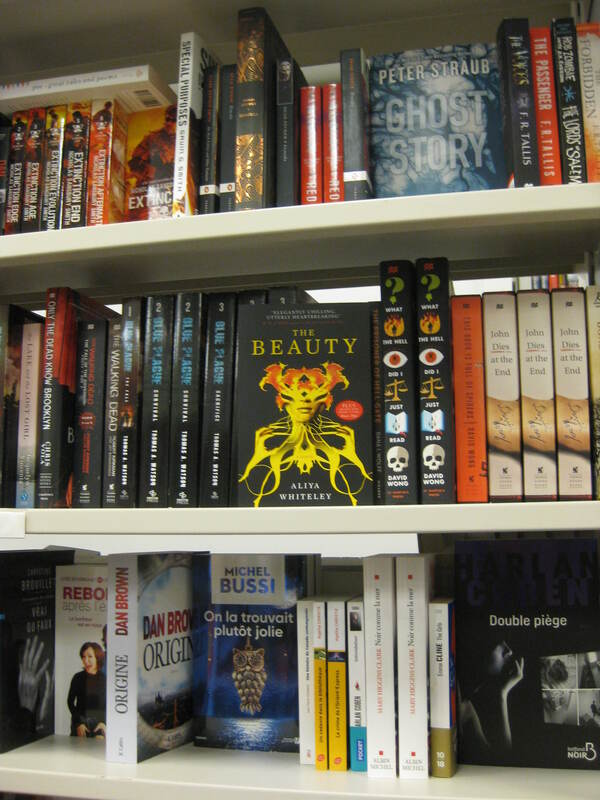 A big thrill of the year for me was taking a trip to Canada and finding copies of The Beauty in the bookshops over there. Amazing. 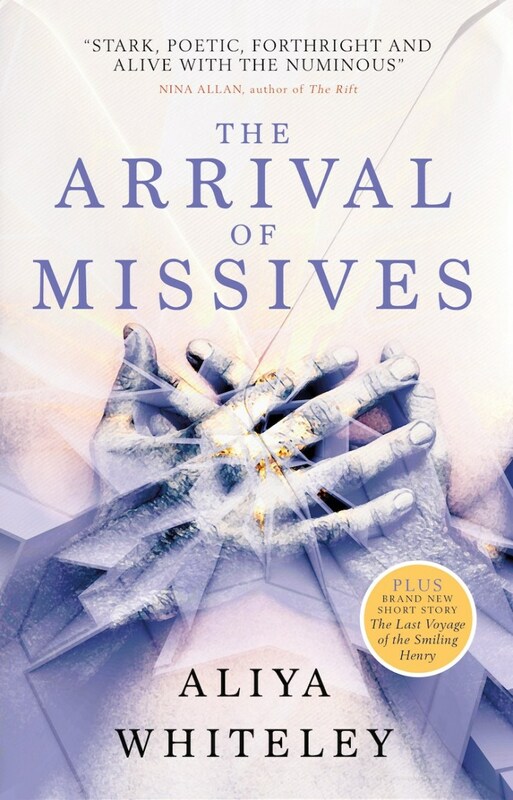 The Arrival of Missives was also published in Italian by Carbonio Editore. L’Arrivo Delle Missive is doing well, I think. 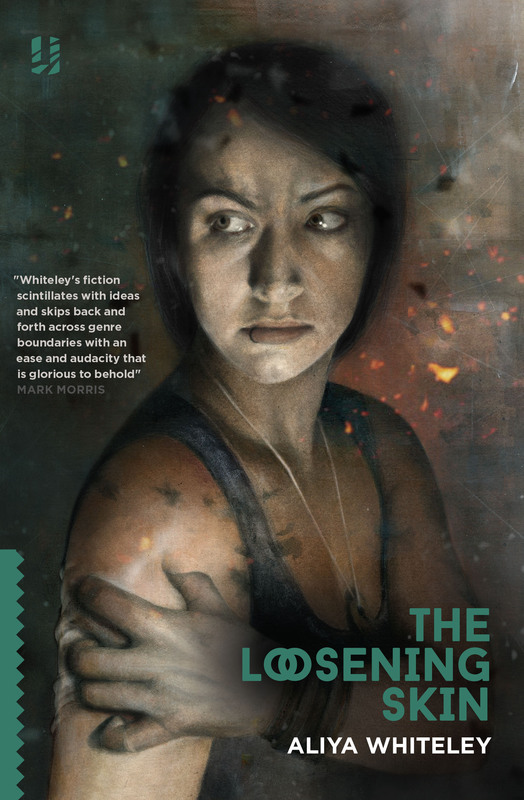 On home territory The Loosening Skin was published by Unsung Stories, and that had a beautiful cover by Tara Bush and gorgeous design by Martin Cox/Vince Haig. 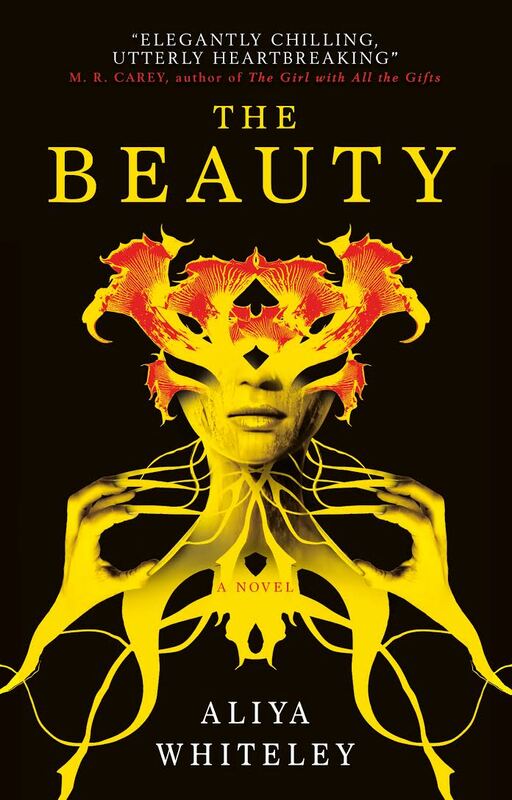 A crime/SF novel about love and relationships, it represented a bit of a change in approach for me, playing with time in the same way that I usually tamper with perspective. It’s quite a personal book for me and I’m glad to see it finding readers. And I was part of the Eden Book Society project, but I can’t tell you any more about that. Ssshhh. The Beauty on the shelf of a Toronto bookshop. Short stories! I had eight of them published throughout the year in all sorts of genres. 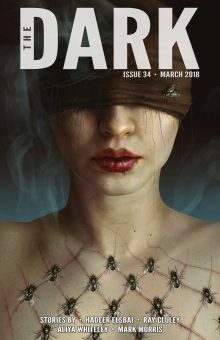 A bit of classic body horror combined with rambling: Corwick Grows was published in The Dark magazine in March. It’s based on a true story. I’ll leave you to work out which bit is true. 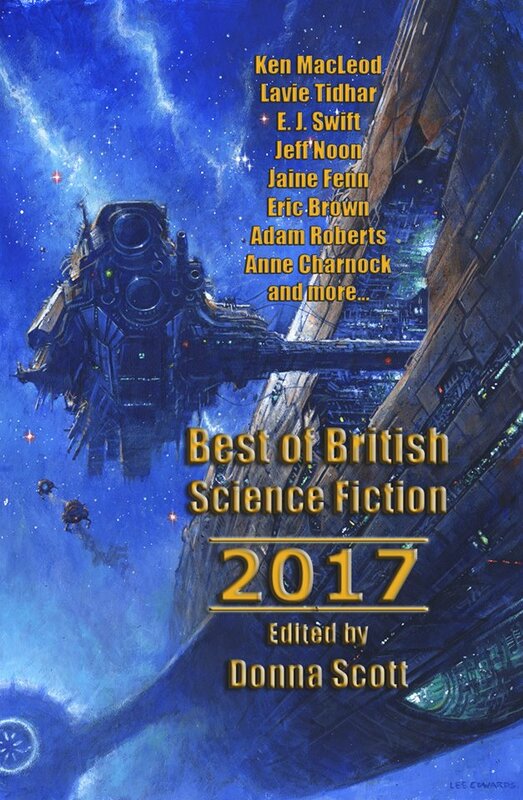 It was a real thrill to see Uniquo (my story from the 2084 anthology) appear in NewCon Press’ Best of British Science Fiction 2017. An old rollercoaster in a future of fear. 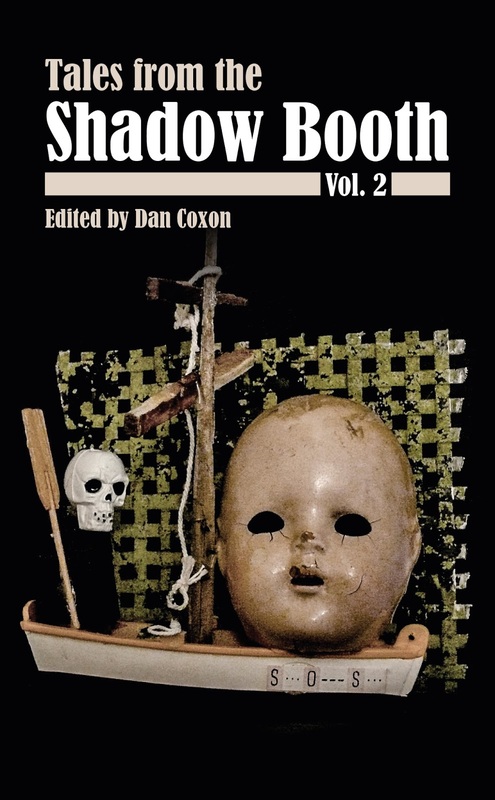 I nearly melted during the month of July but luckily for me the launch party for Tales From the Shadow Booth Vol 2 was in a dank cellar in London, and I sipped on an ice-cold pint while reading my story Ear to Ear aloud. It was wonderful to be part of that collection, and also to be cool for a few hours. Ear to Ear is proper weird – a tale of a butcher’s daughter with a hole through her head – and is one of those stories that makes me wonder about the stuff I come up with sometimes. Chekhov’s Gun appeared in Far Horizons in August. Chekhov’s writing advice is that if you place a shotgun above a mantelpiece in Act One somebody had better used it by Act Five. This inspired a fantasy story about a world with a very big gun, and the relationship of the people to that weapon. It’s about tension, I think, which is classic writing territory to explore. 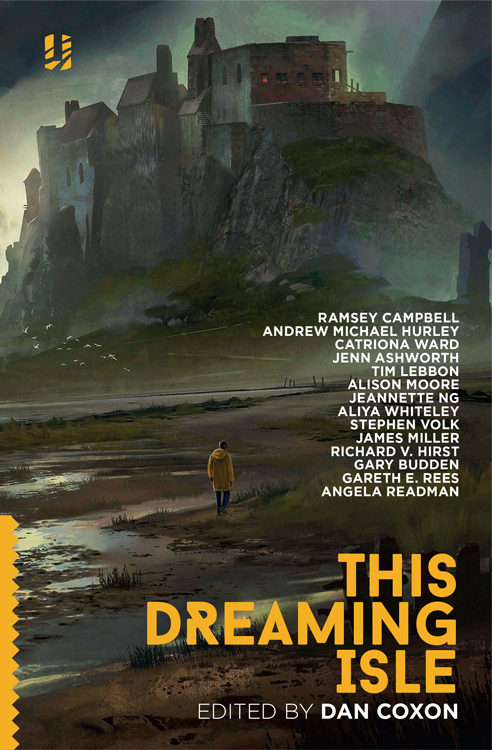 Just the fact that I’ve ever been published in Interzone makes me incredibly proud, and this year my story Territory: Blank made an appearance there. Proper sci-fi future-tech disguised as Victorian exploration, it goes to prove that messing about with time might be something I do more often from now on. 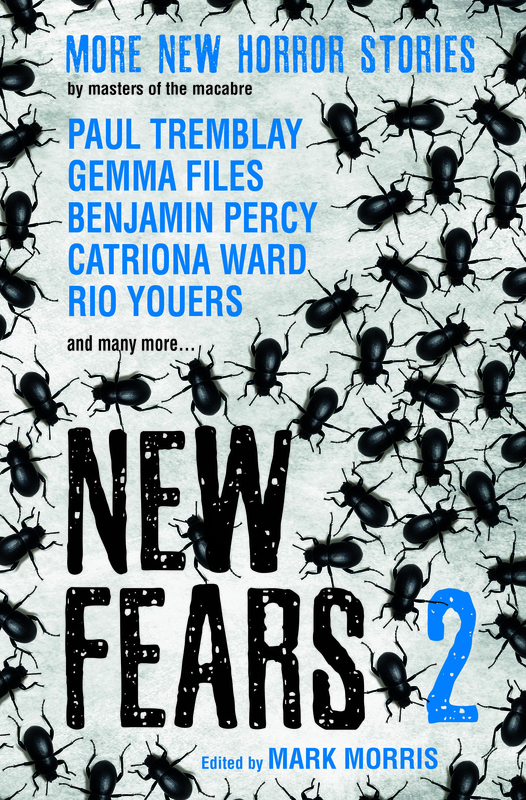 New Fears 2 was published in October and I was so pleased to have a story in that. Pack Your Coat returns to my obsession with stories and the power they hold over us. Also it’s set in Devon. I can’t let a year pass without setting something in Devon. November rolled around and This Dreaming Isle was released into the wild. An Unsung Stories anthology, it featured a fantastic line-up of authors and a wonderful idea – to write about Britain’s darker history. I set my ghost story, Dark Shells, in Lincolnshire. 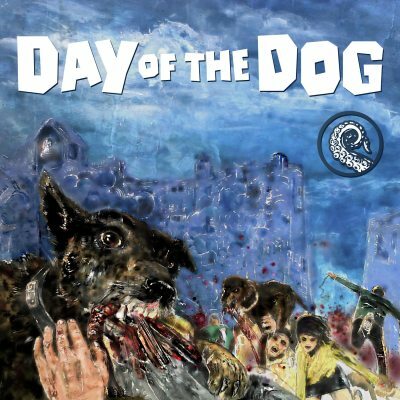 And to finish up there was the reboot of the Drabblecast, my favourite weird fiction podcast, and the joy of hearing their version of my zombie-dog-air-freshener-story Day of the Dog. Ending the writing year on downright strange is so good. When it comes to non-fiction, my big news this year was signing up to write a regular column for Interzone. (See general excitement about Interzone above to give you some idea of how I feel about this.) Following in the footsteps of the marvellous Nina Allan is daunting, no doubt about it, but I’ve written two columns so far and I hope I’m beginning to find my way. And I popped up at my favourite film & TV site, Den of Geek, reviewing a few things such as Sharp Objects and A Discovery of Witches. I also wrote a series for them on the subject of Noir SF Detectives and their Addictions, in which I got to namedrop a few of my favourite books of the year. I’ll do a proper blog post about that in the new year, though, because I’m hoping to read some more brilliant books over the Christmas period and I’d hate to leave them out. Phew. That was a lot of splatting. I have to admit I didn’t get quite as much writing done as I’d like – no novella or novel this year – but that means I’m determined to get some big project done in 2019. Roll on January. But there will be quite a few new things published in 2019 anyway, thanks to all that frantic paddling last year. I can think of three short stories that will be coming up shortly. I think they’re all horror, which is quite exciting; I seem to have written a fair bit of horror this year. My novel of gender roles and storytelling, Skein Island, will be republished by Titan in both the UK and the US next year, and we’ll continue the trend of putting a new novelette with that. I’m working on that right now. But I’ll finish up with a bit of news. It’s already been announced that Unsung Stories will publish my new and very weird SF novel next year. I’m allowed to tell you the title now. It’s Greensmith. Yep. Bring it on. Have a great Christmas, and I’ll see you in 2019.